1911 Amundsen vs Scott is a simple, quick-moving, 2-player race to the South Pole which is full of small decisions. The game is based on the real events where Amundsen beat Scott to the Pole and Scott didn’t return. 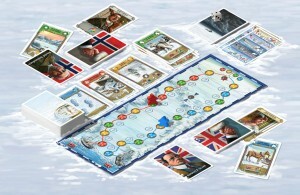 Players each have their own path of coloured spaces to move along and the first player to reach the South Pole wins. On their turn, a player draws 1-3 cards and can then play cards. When taking cards, you must draw the right-most (oldest) 1, 2 or 3 cards by discarding 0, 1 or 3 cards from your hand respectively. This can make for some interesting decisions because if you see cards you really want (or ones you don’t to deny your opponent) then you must decide whether it’s worth discarding cards you have to gain the new ones. 1911 Amundsen vs Scott is a simple 2-player race to the South Pole (and back to the boats if you play the extra advanced variant). The game is based on the real events where Amundsen beat Scott to the Pole and Scott didn’t return. Players each have their own path of coloured spaces to move along. On a player’s turn, they first draw cards which has a nice, simple game mechanic/decision. There are 3 face-up cards and the player can take the right-most (oldest) 1, 2 or 3 cards, and any remaining cards get moved to the right. Each cards show one of 4 colours as well as various special actions – some are used when the player draws the card, and some when a player plays the card. After drawing cards, the player can either (a) play cards to move, or (b) play cards for their special effect (one of which makes the opponent lose their way or move backwards), or (c) play cards to find their route again (due to their opponent making them lose their way). The first player to move onto the South Pole wins.